Oaklyn police and DPW workers rescue a Haddon Township man from Peters Creek Tuesday morning. Credit: Curt Hudson. 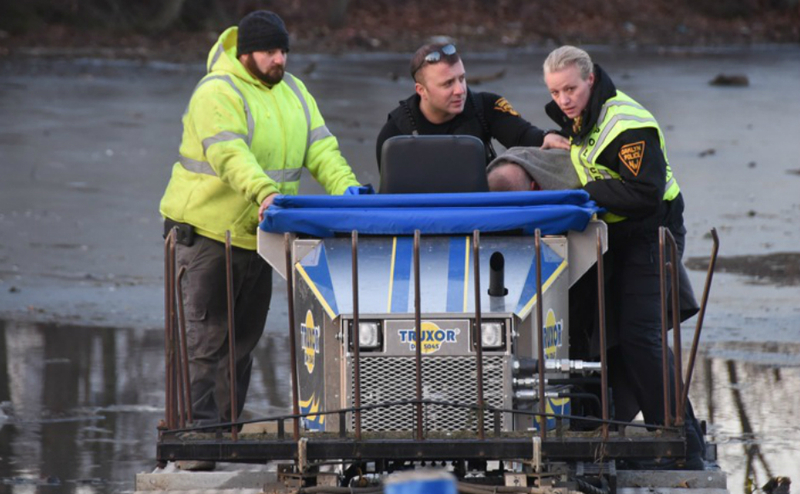 DPW workers who were taking the borough’s Truxor amphibious vehicle out to clean Peters Creek ended up saving a Haddon Township man who had gotten stuck in the frigid waters overnight. Oaklyn Fire Department tows in a Truxor vehicle during the water rescue of a Haddon Township man from Peters Creek Tuesday morning. Credit: Curt Hudson. 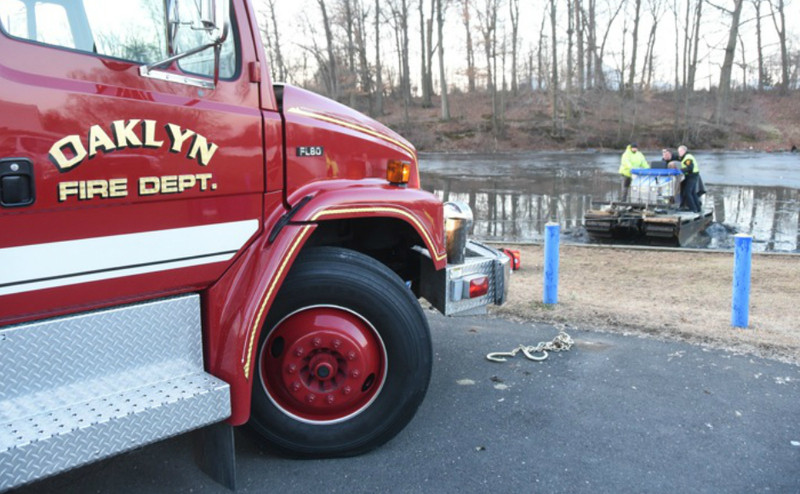 When Oaklyn purchased its own Truxor amphibious vehicle a few years ago, it was done to help the borough control an overgrowth of aqueous plant life in Peters Creek without waiting for approval from the county government. 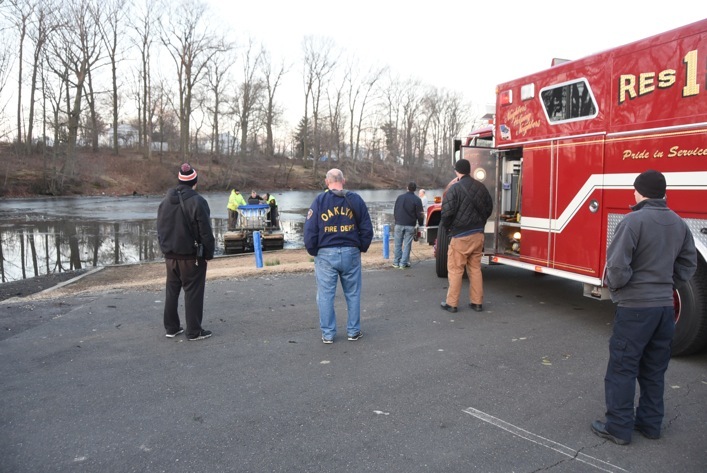 On Tuesday morning, however, the Truxor played the part of a waterborne ambulance, as a joint rescue effort from Oaklyn police, fire, and public works personnel freed a man who’d gotten trapped waist-deep in the freezing churn. Oaklyn DPW workers Chris Marcucci, Alex Santamaria, and Spencer Tussey had taken the vehicle down to the creek behind the Oaklyn Public School a little after 7 a.m. when they spotted a man out about 50 yards from the Audubon Park riverbank. 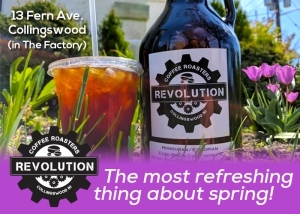 The crew called 9-1-1, and when police arrived, Patrolman Greg Deputy and Detective Jayne Jones hopped on the Truxor and rode out to pull the man free, said Oaklyn Police Chief Mark Moore. “It’s very shallow there, probably only a foot of water, and he was sunk in the mud probably another two feet,” Moore said. “Without a doubt” it was the strangest rescue he could recall. Oaklyn fire, police, and DPW workers rescue a Haddon Township man from Peters Creek Tuesday morning. Credit: Curt Hudson. Oaklyn Fire Chief Scott Cairns said that the man, who identified himself as a resident of the West Collingswood Extension of Haddon Township, had no recollection of how he’d gotten in the water. When asked, the man said he’d remembered watching the Super Bowl but couldn’t provide a timeframe except that he’d been there since dark. “He was extremely lucky,” Cairns said. The man was conscious when he was recovered, if a bit disoriented. He was transported to Cooper University Hospital for signs of cold-weather exposure related to spending “several hours” in the icy water, Cairns said. Although the Truxor was sturdy enough to make its way out to rescue the man, it needed a tow from the winch of the Oaklyn fire engine to make its way back to shore. Cairns said the vehicle helped save first responders from having to don ice rescue gear and enter the water themselves to retrieve the victim. “Obviously it wasn’t the reason for buying that boat, but if I wasn’t planning on going down there to start cleaning up some of the stuff in the creek today, who knows how much longer he would have been stuck in the mud there?” Hawco said. Cairns added that residents always should exercise caution around the waterway, particularly during the winter months. “If you’re going to be around the water, don’t walk out on the ice if you don’t know how thick it is,” he said. CORRECTION: An earlier draft of this story incorrectly stated that the victim had been disoriented while returning home from a Super Bowl party. Instead, the victim, when asked whether he’d watched the Super Bowl, had responded yes. 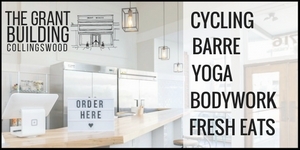 This detail was misinterpreted.